How Can You Avoid Bad Financial Advisors? Fred and Alice Smith are seeking their first financial advisor. They met an advisor at their bank, their insurance agent sells investment products, and they met an advisor at the local office of a major Wall Street firm. They felt three candidates represented enough choices to make a good decision. The next step in their selection process was to interview each candidate with a goal of selecting the best one. Each one had a different sales pitch so it was hard to compare them to each other. So, the Smiths decided to select the financial advisor they liked the best and who also sounded the best. Three years later, the Smiths had lost over 50% of the $1.4 million they turned over to the advisor. It turns out the advisor had a friendly personality and sales skills, but was inexperienced and worked for a firm that put its financial interests first. The Smiths plan to fire the advisor, but they have a dilemma. If they use the same process to select the replacement they may be faced with the same problem in another three years. They are losing money and time! At least the Smiths recognize the process they used to select the financial advisor is part of the problem. They need a better process that will help them select the advisor with the best qualifications, not the best personality or sales skills. I do not want to sound too cynical, but investors can be their own worst enemies when they select, retain, and terminate financial advisors. For example, the Smiths used a subjective process to select an advisor because it was fast and easy. All they had to do was select the advisor they liked the best. No work was required on their part. They paid the price when they lost 50% of their assets. 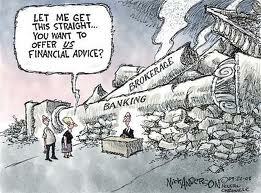 Don’t you think Wall Street has figured this out? It knows investors want to make quick, easy decisions. It knows investors do not want to do any work when they select financial advisors. It knows investors do not have a vetting process for advisors. And most importantly, Wall Street knows investors do not validate sales claims, credentials, experience, and other criteria that impact the competence and ethics of financial advisors. This vacuum opens the door to a number of shady sales practices by financial advisors and their firms. And, investors let it happen. You need an objective process that puts you in control of the information that you are going to rely on to make advisor-related decisions: Selection, retention, and termination. Your process is based on factual data that you have validated with independent third parties that do not make money from you or your assets. And, each advisor has to adhere to your process so they are easy to compare to each other. You can develop your own process or you can use the free process that was developed by Paladin Research (www.PaladinRegistry.com). Paladin provides a three-part online process that starts with a Request for Information that gathers the same data from an unlimited number of financial advisors. Next, a Paladin algorithm measures the quality of advisor responses (we know good answers from bad ones) and produces a quality rating. The third part is a Scorecard that compares advisor qualifications and quality ratings side-by-side so it is easy to identify the best advisors. You win when you interview and select the advisor with the best qualifications, not the best sales skills.